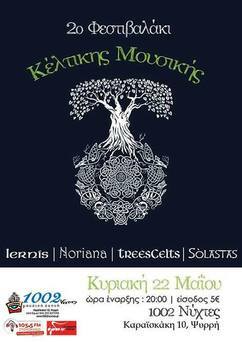 Noriana Celtic Quartet returns to "Asteriskos", (ex "
Aliko") one of the most famous music scenes in Athens. a large theatre with lights and amazing sound. ​sing along and dance! Be our guests! ​night unforgettable! Do not miss it! Our second stop in Creta: Rethymno! creative people that organize events and live music stages. and we are hoping to see you there also. Do not miss this acoustic live! Don’t miss this lovely evening! as well as Giannis Tampakis, manager and producer in La Vita Radio. ​and Nyckelharpa and Petros Lamprides at the bass and viola da gamba. ​Do not miss this special event for Noriana! ​making wishes a reality for children 3-18 years old that have very serious illnesses. ​at the James Joyce pub in the heart of Athens. There will be beer, dancing and of course a lot of Irish music! us for another live, to Irish things up! the pub that makes you feel you are in Ireland! 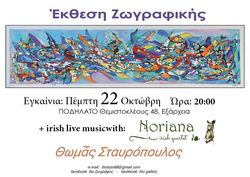 live Irish music from Noriana! ​at The Blinders, on Sunday 18th of March. ​Join us on Saturday 17th of March! ​celebrate with us and enjoy many surprises! tasty food as well as beer and drinks! Join us to begin celebrating! yearly Irish-Greek society’s St. Patrick’s gala ball at Grande Britagne! f St. Patrick’s Day for 2018! heavenly flavors and a big variety of beer! That means it’s the ideal place for our Irish tunes! ​We will be there on Friday, 9 March, join us! ​March is going to be a month with loads of Noriana concerts! This journey begins at Zaz a cozy artistic bar in Pallini. 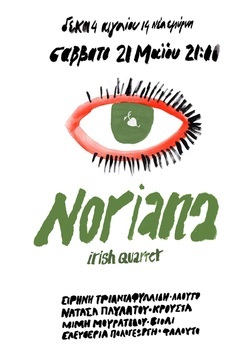 Do not miss this Irish night with Noriana! ​Very unique proposal for the last Sunday of the Carnival! This beautiful pub is inviting us for a Peaky Blinders themed party! Noriana will provide the tunes and the beer is going to do the rest! ​So dress like a Peaky Blinder and join us! and sound, in order to enjoy your favorite Irish tunes! Come and celebrate with us with beautiful Irish melodies! at the amazing pub 7 Monks in Argiroupoli. We invite you for a night full of beer and Celtic sounds! is inviting Noriana for an Irish night! See you all on Friday the 10th at Krokos! groovy live with our beloved Irish songs. place known for its concerts and the amazing hospitality. with autumn mood and summer temperatures! We will be at the amazing bistro of Tilemahos ready for a night to remember! July 16, 2017 @ FESTIVAL "TRAVELLING ENGLAND"
from 12-16 July. The festival has the title "Traveling" and is dedicated to England. of the festival, in a unique environment. ​a lovely place that is trully worth visiting. that are going to play near the sea in LIDO Hotel in Xylokastro. a vacation mood, in a beautiful place! in an original pub that is ideal to make us feel we are in Ireland! and finishing the tour with a unique live! Next step for Noriana's tour is in Keri Rock Bar in Katerini. and enjoy the summer with beautiful Irish songs. June 25, 2017 @ FESTIVAL "VEROIA EVIHI POLI"
five days and is transforming it through the colors of music. who once again will take you to the land of the Celts with their music. that will make you feel you are in Dublin. 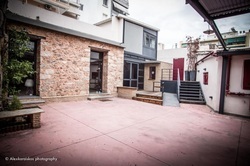 very close to Iraklion metro station. which is ideal for an acoustic live. at the "Blue Bear " bar, in the center of the city. We are welcoming spring with fresh songs and mood! ​and dance while drinking Irish beer! 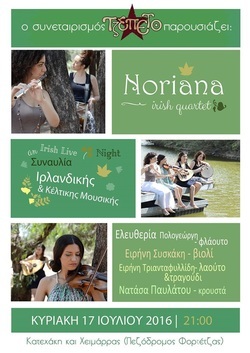 ​A day before St. Patrick's day Noriana will be performing again at their favorite pub in Alimos! Amazing food and drinks, alongside the warmest staff and lots of Irish music of course! We will be happy to see you there! without loud volumes, ideal for an audience that wants to focus on the music. ​Seek freedom of expression and space to breathe and grow! with amazing beer, wonderful people and lots of fun! mood, ready to share with you lovely irish songs and tunes in our favorite bar of Monastiraki, Poems & Crimes! Don't miss this last live of 2016! 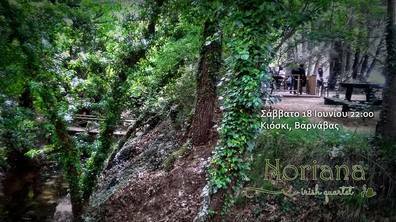 As the winter is getting closer, Noriana are going back to the lovely Sillywizards, Irish pub in Agia Paraskevi. Great collection of irish beers, atmposhere that takes you straight to Dublin and of course Noriana quartet looking forward to this live! the Autumn with fresh mood and great irish songs. Be there! Co - operative". Feel free to join if you're close! Athens (about 35 minutes away) under big trees and next to a river. in the right side of the street! hosts the most interesting and unique bands of Athens. of dishes for all tastes and of course Noriana's lovely irish songs, live! and Noriana will accompany them with sounds and lovely irish tunes. Magic Sunday mornings 17 & 24 April, don't miss! as in Ireland it's a 3 day feast! an ideal place for irish live music! full of surprises, gifts and lots, lots, LOTS of Guinness! Can't miss! 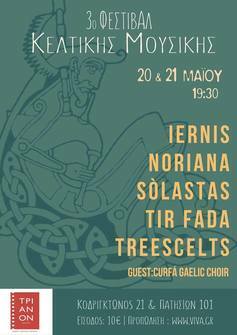 Jazz Point in Syntagma gets an "irish costume"
Ampelokipi, fr a big gig with more and more irish songs! will be waiting in "Spirto" Bar! See you there! of beer and a delicious cuisine! In the known, favorite pub Silly Wizards of Agia Paraskevi, on Sunday, December 13.
of the loveliest music scenes of the center of Athens city. and unique bands of Athens. and favorite heroes of fairy tales. with daily activities and full-day program on weekends. 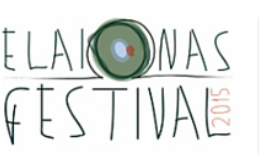 one of the most innovative festivals of Athens, ELAIoNAS 2015 Festival.